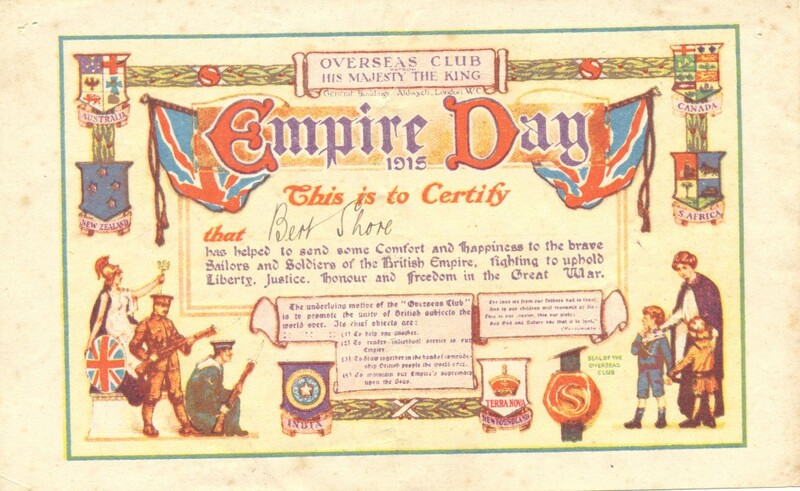 Bert Shore’s Empire Day, 1915 certificate from the Overseas Club – with thanks to Market Lavington Museum. Bert Shore’s ‘Xmas’, 1916 certificate from the Overseas Club – With thanks to Market Lavington Museum. Albert (Bert) Shore was born in 1906, West Lavington, Wiltshire. In 1915, and again in 1916, Bert was one of many children involved in fundraising through the Overseas Club (now the Royal Over-Seas League); the money raised was used to send gift boxes to sailors and soldiers, so they could have some of the comforts of home while fighting abroad. Certificates were given to children who managed to raise a certain amount of money, so Bert must have been a keen fundraiser. In 1940 Bert married Flo Burbidge, who was born in 1908, in the building that now houses the Market Lavington Museum! Flo and Bert lived in the Market Place in Market Lavington, and many of their artefacts are now at the Market Lavington Museum, including these certificates. General Buildings, Aldwych, London. W.C. This is to Certify that Bert Shore has helped to send some comfort and happiness to the brave Sailors and Soldiers of the British Empire, fighting to uphold Liberty, Justice, Honour and Freedom in the Great War. 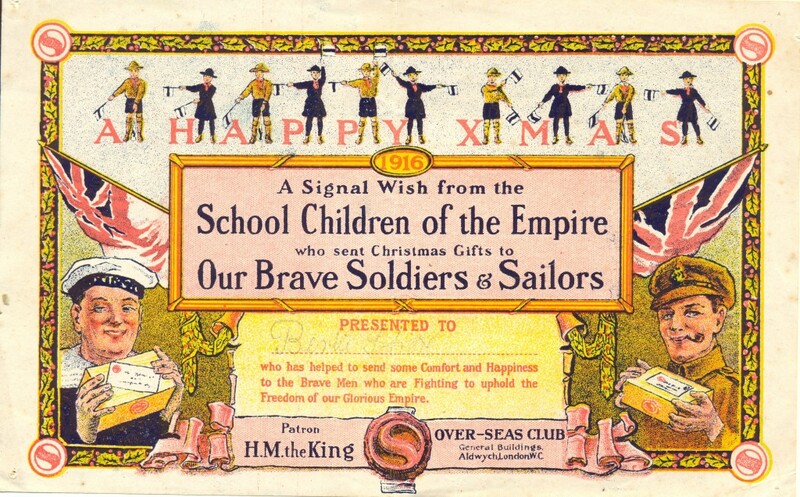 A Signal Wish from the School Children of the Empire Who sent Christmas Gifts to Our Brave Soldiers & Sailors. PRESENTED TO Bert Shore who has helped to send some Comfort and Happiness to the Brave Men who are Fighting to uphold the Freedom of our Glorious Empire. General Buildings, Aldwych, London W.C. Images and information supplied by Market Lavington Museum.